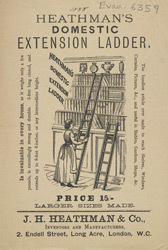 This leaflet is advertising Heathman's Domestic Extension Ladder and features a maid using a ladder to reach the higher shelves in a library. It was fashionable for large Victorian houses to have well stocked libraries, even if the owners didn't actually read the books. Books filled the shelves and were fitted from floor to ceiling and so the only way to reach them to get them out or to dust them was by climbing a ladder like this one.